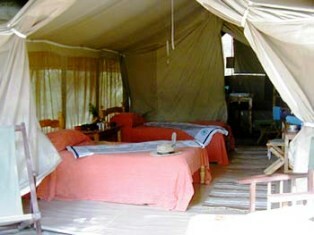 Duma Camp, in the northwest corner of the world famous Maasai Mara in Kenya, is a private luxury camp. This semi-permanent facility has an air of uniqueness, offering utmost comfort, excellent cuisine, bush picnics, sundowners in places with unbelievable views, as well as walks and hikes escorted by Maasai guides. Duma Camp is located in the heart of Maasai country, bordering Kenya’s great Masai Mara Game Reserve. It is a traditional safari camp in true ‘Out of Africa’ style – and with ten beds one of the smallest upscale camp in the Mara. It is ideal for those guests who enjoy the privacy, personal attention and an informaland homely atmosphere. Duma is an ideal base from which to enjoy the spectacle of the annual wildebeest migration from Serengeti in Tanzania to Masai Mara. It is while in Masai Mara that the migration is at its most concentrated. The central dining area is under canvas and offers a view over the open plains a waterhole and salt lick. Weather permitting, dinners are often served al fresco under a canopy of stars, next to an open fire. The camp is unfenced but Maasai askaris guard the perimeter against possible dangerous game that could wander through. Enjoy game drives, guided walks, bird watching, and cultural visits to a Maasai village. The weekly cattle market at Aitong is well worth a visit as Maasai from all over the area congregate to trade cattle, and market goods.